The NIOSH Mining program is conducting mine illumination research to address the visual needs of the aging miner workforce and to improve miner safety by reducing glare and improving a miner’s ability to see mine hazards associated with slip/trip/fall accidents and moving machinery accidents. This research contributes to improvements in mine lighting so that miners can better see hazards; thus, the research will enable a reduction of accidents. One result of this research is a light-emitting diode (LED) area light called the NIOSH Saturn. NIOSH developed the Saturn light for roof bolting machines with the goal of maximizing floor illumination while reducing glare. The Saturn light utilizes a downward facing mount so that it can better illuminate the floor. However, other mounting orientations are also possible, such as facing it upward to illuminate the roof. The existing illumination provided by traditional lighting for a roof bolter (left). 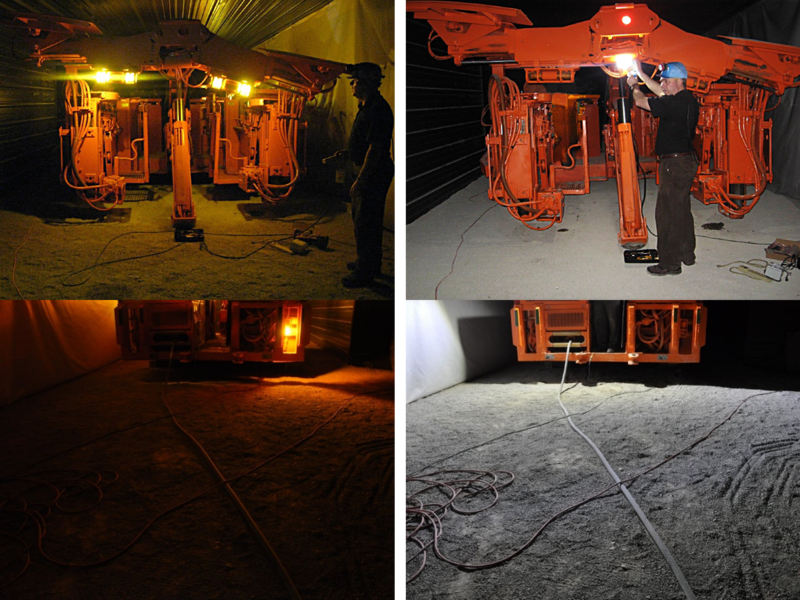 The improved illumination provided by the NIOSH-developed Saturn LED area light (right). Photos by J.H. Fletcher & Co. Click for larger image. The downloadable ZIP file includes a PDF describing a functional overview of the Saturn area light, a README file, and numerous individual software and schematic files created by NIOSH or NIOSH partners in this research. The CDC's Technology Transfer Office has approved the public release of these files. 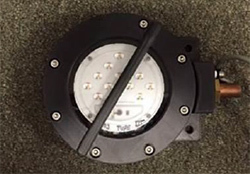 For further information about NIOSH illumination research or working with the downloaded documentation, contact NIOSH Electrical Engineer John Sammarco at 412-386-4507 or ZIA4@cdc.gov.